High mpg used-car bargains | What Car? With the price of fuel threatening an all-time high, you might be thinking its time to slash your bills and buy a more-efficient motor. However, you dont need to splash out a fortune in order to save yourself money at the pumps. Weve got eight super-efficient used cars from 3000 that promise over 60mpg and cost 30 or less per year to tax. The Panda is a bit of a bargain, with low prices and high economy. Its ideally suited to urban driving, and perfect for squeezing into small parking spaces. Its a supermini, so rear legroom is limited, but its comfortable and fun to drive. You also get electric front windows, remote central locking and a CD player. Diesel Pandas arent that common on the used market, but dealers are a good place to start. Audis baby MPV was ahead of its time, with its lightweight aluminium body and small diesel engine. Its surprisingly spacious and superbly built, and it has gained a bit of a cult following. Theres a limited number still on the road, and as a result, prices can be steep, but if you shop around you should still find a bargain. Private sales are the best. Spacious, comfortable, and practical, this Toyota is the epitome of greener motors. There are loads to choose from on the used market, and prices are competitive. The boot isnt as big as those in some small family cars, but because its a hatchback its easy to load. Dont be put off buying a high-mileage Prius, this hatchback performs well in reliability and owner satisfaction surveys. Hondas answer to the Toyota Prius isnt quite as efficient, but its still a breath of fresh air compared with most small family cars. Theres lots of leg- and headroom inside, and the boot is a good size. However, because its a saloon, practicality is limited. Many are now with independent garages and car supermarkets, but the best examples are still with franchised dealers. The Citroen C1, Peugeot 107 and Toyota Aygo, are effectively the same car underneath, and used prices are broadly similar, but there are slightly more 107s on the market. This is a compact supermini, so dont expect much in the way of cabin space or performance but its easy to live with and frugal. If you want more miles per gallon, Toyota and Citroen have made diesel versions - but theyre not much more economical, and very hard to find on the used market. If youre prepared to look at a car with higher than average mileage then one of the best, and most frugal, Superminis can be yours for under 5000. The latest Corsa is bigger than the previous car, and can handle two passengers in the back with ease. Factor in the great handling and solid build quality and youre onto a winner. Theres also a newer Ecoflex Corsa available, capable of 67.3mpg, but its still a bit pricey. The Micra makes the most of its Renault-designed diesel engine to give great fuel economy. Reliability is good and its fun to drive, although its not very refined at motorway speeds. The diesel Micra is less common than the petrol versions, but dealers, independents and supermarkets all have good examples. The Smarts natural habit is city streets, where its compact dimensions and tiny engine allow it to slip through traffic efficiently. 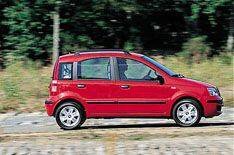 Its a two-seater, but the boot is a reasonable size and shape for such a small car. Its also comfortable and easy enough to drive, although it may take time to get to grips the jerky auto gearbox. Look to independents and private sellers for the best value.